George Romero changed the nature of zombies when Night of the Living Dead arrived in 1968. He made them uncontrollable mobs that rose from the grave for an unknown reason with only the desire to eat the flesh of the living. They were a force that wouldn’t stop once they got a hint of a non-zombie in the area. 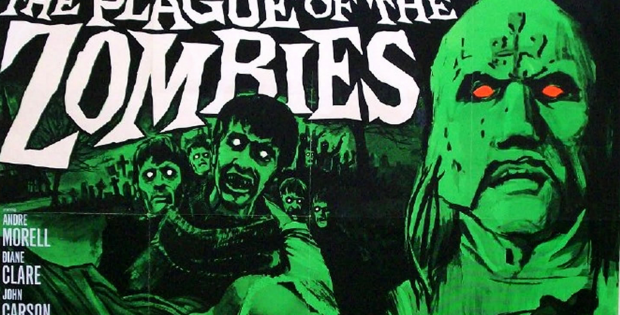 When Hammer released The Plague of the Zombies in early 1966, their zombies rose from the grave in the traditional way and weren’t self-starters. They were still dangerous undead creatures since once they were given orders, they didn’t want to stop. This added a bit of mystery along with the mayhem since the living in The Plague of the Zombies must figure out who is controlling the dead. A plague has struck a small English village in the 1860s. Dr. Peter Tompson (Where Eagles Dare‘s Brook Williams) is useless and thus calls in his pal Sir James Forbes (The Mummy’s Shroud‘s André Morell) to investigate and possibly find a cure. He takes the first coach to the town with his daughter (The Haunting‘s Diane Clare). In order to investigate the disease, the two man attempt to dig up the deceased for a poke around. But there’s a serious issue when they keep finding the coffins empty. Where did the bodies go? Well it turns out that the nearby estate is owned by Squire Clive Hamilton (Captain Kronos – Vampire Hunter‘s John Carson). The nobleman had spent quite a bit of time down in Haiti. Did he pick up any local customs like bringing the dead back to life? Maybe he’s the key to this all. The Plague of the Zombies reminds us that zombies were created as an extra cheap form of labor. In this film, the zombies run a dangerous business site as well as roam around the countryside and terrorize the locals. It’s busy being undead. There’s quite a bit of blood on the screen except it’s from ceremonies and not brain eating. This would be the only zombie film made by Hammer even though they made several films about vampires, Frankenstein and mummies. The film was part of the four films that Hammer made at the same time in order to save on production costs and have two double features ready for 20th Century Fox that was their new American distributor. Director John Gilling would immediately produced The Reptile using a majority of the cast and the same sets. Although it would be double billed with Dracula: Prince of Darkness to not give away their genius budget saving production move. Even with it’s old fashioned walking dead, The Plague of the Zombies is infectious viewing. The video is 1.66:1 anamorphic. The image is a major upgrade over previous releases of the film. The colors now pop on the red jackets during the fox hunting scene. The audio is DTS-MA HD Mono. They tweaked and cleaned up the sound so you can enjoy James Bernard’s score. Audio Commentary With Filmmakers Constantine Nasr and Ted Newsom and Film Historian Steve Haberman. Nasr has made zombie films and even got to play a zombie on The Walking Dead. The trio dip into history film. They talk about how the US versions and the UK cut differ from the placement of the opening credits in the prologue. Audio Commentary with Author/Film Historian Troy Howarth also gives quite a bit of detail on the production and the cast. World Of Hammer – Mummies, Werewolves & The Living Dead (24:55) is another installment of the TV series that celebrated the movie studio. Oliver Reed narrates details as clips from the movies play. He eve gets to talk about his time in Curse of the Werewolf. Raising The Dead: The Making Of The Plague Of The Zombies (35:27) allows John Carson to ponder how he mostly gets recognized for Hammer Horror and not his classical work. But he does like to be remembered. Jacqueline Pearce talks of seeing the film premiere. Mark Gatiss (Sherlock) likes Zombies more than Dracula: Prince of Darkness. Restoration Comparison (3:37) shows how much work went into making the image cleaner and richer. You’ll want to upgrade. Theatrical Trailers (7:25) sets up the terror of the village of the undead. There’s also a double feature ad with Dracula: Prince of Darkness that promises to give you vampire teeth or zombie eyes. Still Gallery (7:10) has dozens of photos from the set and posters. Scream Factory presents The Plague of the Zombies. Directed by John Gilling. Screenplay by: Anthony Nelson Keys. Starring: André Morell, Diane Clare, Brook Williams, Jacqueline Pearce & John Carson. Rated: Unrated. Running Time: 90 minutes. Released: January 15, 2018.